Little by little, the zero emissions revolution in transportation is spreading to boats and ships. Perhaps electric transoceanic container ships are not in the offing any time soon, but from personal watercraft to the ferries and cargo ships that ply coastal waters, the change to electric motors instead of diesel engines is happening quite quickly. Founded in 2005, Torqueedo is the leader in electric propulsion for pleasure craft — from tiny trolling motors suitable for use on kayaks to lusty inboard motors for yachts. 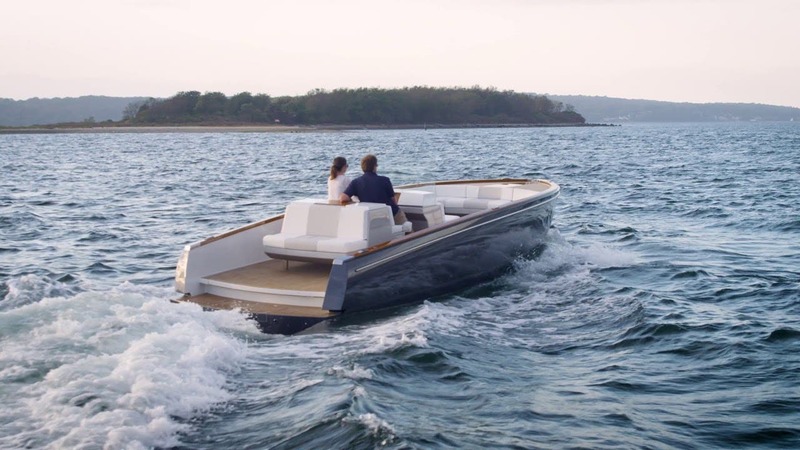 At this moment, the highest expression of what is possible in electric yachting is the Dasher from Hinckley, the perfect boat for admirers of Jay Gatsby and the green light at the end of Daisy Buchanan’s dock. The Dasher features twin Torqueedo motors rated at 50 kW each. For 2019, however, the company has doubled the output of its top of the line motors to 100 kW. [Note — horsepower is an inexact way of measuring the output of electric motors. For those who are still frightened of the metric system, multiply kW by 1.3 to get an approximation of the horsepower equivalent.] The new motors are available in low rpm configuration for displacement hull boats as well as a high rpm version for boats with a planing hull. The greater output requires an increase in battery power as well. The company’s latest Deep Blue battery features an energy density of 144 Wh per kilogram. At 40 kWh, it has 30% more capacity in the same footprint as the previous version. The company’s range of 24 volt batteries to power the companies range of small electric outboard motors also benefit from the 30% increase in energy density. “By delivering more power, more energy, more silence and more convenience, Torqeedo honors its commitment to improve customers’ boating experiences and advance marine electric mobility every year,” says Christoph Ballin, CEO of Torqeedo. Leclanché is the largest battery manufacturer you have never heard of. Headquartered in Switzerland, its battery cells are produced in Germany. It has been selected by Kongsborg Marine to supply 45 MWh of batteries for an electric coastal freighter and 8 passenger ferries in Europe. YARA, a fertilizer company, is building YARA Birkeland, the world’s first autonomous and electric coastal freighter with zero emissions. Using sea lanes instead of roads, it will eliminate 40,000 deliveries a year by diesel-powered trucks. Grimaldi is one of world’s largest operators of roll on/roll off cargo and passenger ferries in the world. Its newest vessels, known as Grimaldi Green 5th Generation ships, will feature hybrid power — diesels while at sea and electric in port. Batteries supplied by Leclanché will provide the electrical power for the hybrid propulsion systems supplied by Kongsborg. The Legacy of the Fjords will be a carbon fiber catamaran capable of transporting 400 passengers with zero emissions. To meet the needs of its new green vessel, the company will utilize the innovative Power Dock, a floating device that will draw power from the local grid gradually while the ship is not in port, then recharge its 2.4 MWh battery in just 20 minutes, avoiding expensive power surges when the ship is in port. The Power Dock also stores consumables and waste products from the ship to keep the water around it free of pollution. Two ferries, the Tycho Brahe and the Aurora, transport more than 7.4 million passengers and 1.9 million vehicles a year across the 2.5 mile wide strait that separates Sweden and Denmark. Both of the 328-foot long ferries built in 1991 have now been converted from diesel power to electricity. Each now has a 4.2 MWh battery system to power an electric propulsion system controlled by technology supplied by ABB, which has also designed and installed an innovative automated shoreside charging system. Using 3D laser scanning and a wireless communication link between the ferries and the shore, the vessels are connected robotically to charging equipment once they dock. The system minimizes connection time, leaving more time for charging the ferries’ batteries. Color Hybrid, which will be the largest plug-in hybrid passenger ship in the world, is now under construction and is expected to enter revenue service in the summer of 2019. The 525-foot long vessel will carry 2,000 passengers and 500 vehicles on Norway’s popular Sandefjord to Strömstad route. While near land and in port, it will be powered by an electric propulsion system supplied by Siemens using batteries from Corvus. Electric maritime news is not confined to Scandinavia. Canadian firm Shottel has been supplying diesel powertrains to commercial vessels in that country for generations. Now it has signed a contract with Damen Shipyards to supply electric propulsion to two new ferries for the ministry of transportation in Ontario. The new ships are expected to eliminate more than 15 million pounds of carbon emissions annually. The Amherst Island ferry will accommodate 300 passengers and 42 cars. It is expect to enter service in 2020. The Wolfe Island ferry will handle 399 passengers and 75 cars. It is expected to be completed in 2021. Both will have a speed of 12 knots — the same as conventional ferries. Both will be equipped with four Schottel 550 kW propulsion units. An onboard diesel engine will provide backup power as needed. Viking, the largest marine lifeboat and survivability company has completed heavy weather sea trial testing of its latest technology, the electrically powered LifeCraft system designed to replace traditional lifeboats on cruise ships. The system consists of four self-contained units intended to be combine the maneuverability of a life raft with the capacity of a life boat. Each system can accommodate up to 812 passengers. Each of the four components has four electric motors — one at each corner — for superior maneuverability without the dangers associated with fossil fuels, including toxic exhaust emissions that may enter the rescue compartment during adverse sea conditions. The motors also require much less maintenance than conventional internal combustion engines. The whole purpose of lifesaving equipment at sea is to perform under the most rigorous conditions. Recently, Viking subjected its LifeCraft system to testing in the most difficult conditions imaginable — waves up to 30 feet high and wind speeds greater than 40 miles per hour. It passed all the tests with flying colors. “We launched the LifeCraft with the ship heading 3 knots up against the wind, exposing the system to the full force of the fierce weather in the most critical test phase,” says Viking vice president Niels Fraende. “We then demonstrated — with a simulated dead ship condition — that the fully loaded LifeCraft system provides a safe and stable means of evacuation on both the weather and lee sides for several hours. The LifeCraft system uses a novel chute escape system designed to transport landlubbers safely from the comfort of the dining deck to the waiting rescue craft far below in turbulent seas. All landed safely in the LifeCraft unit at the expected evacuation speed, dry and unbrushed by the elements the company reports. Decarbonizing the transportation sector involves much more than getting people to drive electric cars. The diesel engine is the backbone of most freight and cargo operations, which in turn are the basis for virtually all commerce. In many parts of the world, ferries are an integral part of transportation systems just as much as subways are in urban areas. Little by little and step by step, waterborne transportation is awakening to the revolution made possible by batteries and electric motors, bringing zero emissions transportation to more people in more places. Taken together, all of the news above represents an important advance in creating a more sustainable environment for us all.